Maya Rudolph and Fred Armisen are heading to Amazon. Deadline reports the streaming service has ordered a new TV show starring the Saturday Night Live alums and a new drama called Tong Wars. From Paul Attanasio and filmmaker Wong Kar-wai, Tong Wars “is set against the Tong Wars of 19th century San Francisco.” Kar-wai will direct, and Attanasio will pen the scriopt. Armisen and Rudolph are executive producing and starring in a new Amazon comedy series from Matt Hubbard and Master of None co-creator Alan Yang. No further details about the plot have been released, but Deadline reports the two stars will be playing a married couple. What do you think? 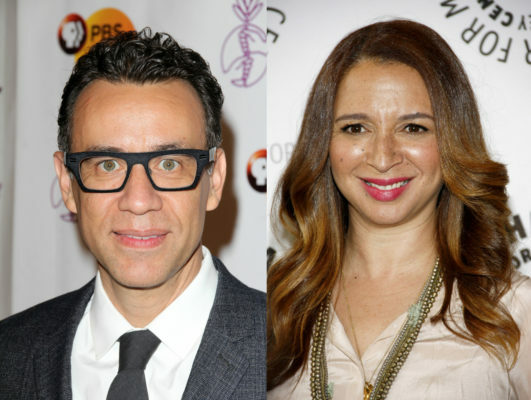 Are you a fan of Fred Armisen and Maya Rudolph? Will you watch their new Amazon series? More about: Amazon TV shows: canceled or renewed?, Tong Wars, Tong Wars: canceled or renewed? Yeah, longevity isn’t really Amazon’s “thing”, but this does sound interesting. I nearly passed over it because I thought it was just another cooking show! I would have to say while I Love both stars I can’t watch anything new on Amazon. Cancelling Zelda with a Z, and the Last Tycoon not because they were bad but rather too expensive has caused me to lose faith in Amazon Series. I will stick with Netflix they stick with what they promise. I’m expecting Mozart in the Jungle and Red Rock to receive the same treatment as the above 2 series. you mean like netflix cancelled sense 8 and marco polo because they were too expensive? bleh, they are all the same.